We study molecular and cellular mechanisms by which neuronal survival, neurite growth, and synaptogenesis are regulated by neural activity or membrane depolarization. For studies of survival, we principally use spiral ganglion neurons (SGNs) in the cochlea. SGNs are dependent on their presynaptic input, the hair cells, for survival, but the death of SGNs after hair cell loss can be reduced by electrical stimulation. This permits studies of neuronal survival in vivo in parallel to studies of cultured neurons. Our studies of intracellular signaling in SGNs in vivo after loss of hair cells have shown that SGN death occurs in two phases, an early phase associated with loss of prosurvival signaling and a later phase associated with increased proapoptotic or 'stress' signaling. Our studies of cultured SGNs in vitro have dissected the complex intracellular signaling initiated by membrane depolarization using a molecular genetic approach, in which genes encoding mutant activated or inhibitory protein kinases or transcription factors are introduced into the neurons. We have identified the intracellular signaling pathways that mediate the prosurvival effect of membrane depolarization: Ca2+/calmodulin-dependent protein kinase II (CaMKII) and CaMKIV, and cyclic AMP-dependent protein kinase (PKA). We have further determined the subcellular location at which they act and some of their key targets. These studies are relevant to the use of cochlear implants, currently the most effective treatment for sensorineural deafness. These implanted electrode arrays provide direct electrical stimulation to SGNs in hearing impaired people who lack hair cells. Understanding how electrical stimulation affects SGN survival and axon growth will lead to improved implants for treatment of the hearing impaired. The intracellular signals that link neural activity to survival also link neural activity to stabilization and remodeling of synapses. In collaboration with Michael Dailey and his lab, we have observed fluorescently-labeled synapses in brain slices, in which the organization of the neurons, their synaptic interactions, and their associations with glial cells remain intact. We have described the effects of elevated neural activity on synaptic remodeling, which is relevant not only to normal development and maturation of the brain but also to the consequences of epilepsy. Using molecular reagents originally developed for study of neuronal survival, we have demonstrated a role for CaMKII and are also investigating roles of PKA and peptide neurotrophic factors in synaptic remodeling. 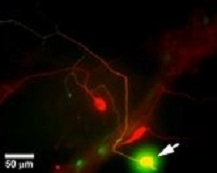 Shown in the figure is a digitally-captured photograph of three spiral ganglion neurons in culture fluorescently labeled red using an antibody to neurofilament-200 and a red fluorescent secondary antibody. One of these neurons has been transfected with a gene encoding CaMKIV and green fluorescent protein, evident by the green-yellow fluorescence. This page was last updated on Tuesday, March 10, 2015 - 10:34am. Please contact us at biology@uiowa.edu or 319-335-1050 if you need further information.